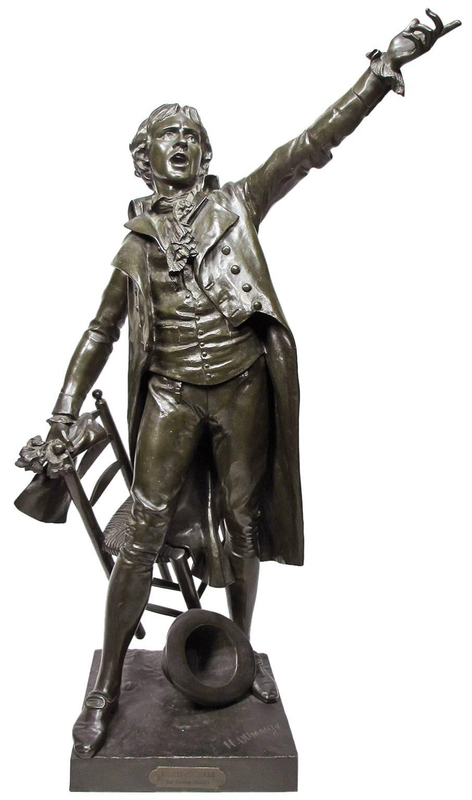 Henry Etienne Dumaige (French, March 30, 1830-March 31, 1888) A Fine and Large French 19th Century Bronze Sculpture of French Journalist and Politician "Camille Desmoulins" (Lucie Simplice Camille Benoît Desmoulins), in a brown patina, depicting a standing Demoulins with his left arm raised while holding a tilted chair, his top-hat under it. Bronze with brown patina. Circa: Paris, 1882. Henry Etienne Dumaige (French, March 30, 1830-March 31, 1888) studied sculpture under Féuchère and Dumont. He exhibited his sculptures depicting groups, statues, and busts at the Salon from 1863-1886. 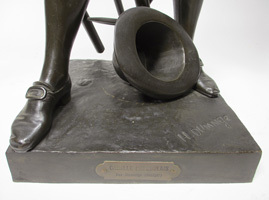 He is most known for his statuettes of dancers and historical French figures. He sculpted a large number of busts, groups and statuettes in marble, plaster and bronze, including this statuettes of Desmoulins and another of Rabelais. In 1864 he exhibited a group in bronze entitled " L'âge d'or", "Hero", in 1864, "Retour des champs" in 1866, a marble bust of Moliere in 1872, a statuette entitled Francois Rabelais in terra-cotta in 1873, a statue in marble for the city hall in Tours in 1880, "Camille Desmoulins" in plaster 1882, and "Patrie", a bronze in 1886. 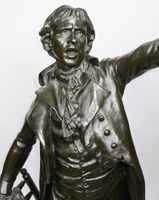 Different works were cast in bronze, in particular, dancers, as well as works entitled, Salome, and Esmeralda, and also a grenadier of 1792 entitled Après les combat, a reduction of Camille Desmoulins. Lucie Simplice Camille Benoît Desmoulins (French, March 2, 1760-April 5, 1794) was a journalist and politician who played an important role in the French Revolution. He was a childhood friend of Maximilien Robespierre and a close friend and political ally of Georges Danton, who were influential figures in the French Revolution. Fesmoulins was born at Guise, Aisne, in Picardy. His father, Jean Benoît Nicolas Desmoulins, was a rural lawyer and lieutenant-general of the bailliage of Guise. Through the efforts of a friend, he obtained a scholarship for the fourteen-year-old Camille to enter the Collège Louis-le-Grand in Paris. Desmoulins proved an exceptional student even among such notable contemporaries as Maximilien Robespierre and Louis-Marie Stanislas Fréron. He excelled in the study of Classical literature and politics, and gained a particular affinity for Cicero, Tacitus and Livy. He pursued law, and succeeded in gaining acceptance as an advocate of the parlement of Paris in 1785. However, his serious stammer and ferocious temper proved severe obstacles to success in this arena. Thus stymied, he turned towards writing as an alternative outlet for his talents; his interest in public affairs led him to a career as a political journalist. In March 1789, Jean Benoît Nicolas Desmoulins was nominated as deputy to the Estates-General from the bailliage of Guise; however, due to illness, he failed to take his seat. Camille Desmoulins, himself limited to the role of spectator at the procession of the Estates-General on May 5, 1789, wrote a response to the event: Ode aux Etats Generaux. The Comte de Mirabeau, a powerful political figure within the Estates-General who positioned himself as a bridge between the aristocracy and the emerging reformist movement, briefly enlisted Desmoulins to write for his newspaper at this time, strengthening Desmoulins' reputation as a journalist. Owing to his difficulties in establishing a career as a lawyer, Desmoulins' position in Paris was a precarious one. However, he was greatly inspired and enthused by the current of political reform that surrounded the summoning of the Estates-General. In letters to his father at the time, he rhapsodized over the procession of deputies entering the Palace of Versailles, and criticized the events surrounding the closing of the Salle des Menus Plaisirs to the deputies who had declared themselves the National Assembly - events which lead to the famous swearing of the Tennis Court Oath. The sudden dismissal of popular finance minister Jacques Necker by King Louis XVI on July 11, 1789 proved the spark that lit the fuse of Desmoulins' fame. On July 12, spurred by the news of this politically unsettling dismissal, Desmoulins leapt onto a table outside the Cafe du Foy (one of many cafés in the garden of the Palais Royal frequented in large part by political dissidents) and delivered an impassioned call to arms. Shedding his customary stammer in the excitement, he urged the volatile crowd to "...take up arms and adopt cockades by which we may know each other", calling Necker's dismissal the tocsin of the St. Bartholomew of the patriots." The stationing of a large number of troops in Paris, many foreign, had led Desmoulins and other political radicals to believe that a massacre of dissidents in the city was indeed imminent. This was an idea that his audience also found plausible and threatening, and they were quick to embrace Desmoulins and take up arms in riots that spread throughout Paris rapidly. The "cockades" worn by the crowd were initially green, a color associated with liberty, and made at first from the leaves of the trees that lined the Palais Royal. However, the color green was also associated with the Comte d'Artois, the reactionary and conservative brother of the King,and the cockades therefore were quickly replaced by others in the traditional colors of Paris: red and blue. The forces semi-organized under this banner attacked the Hôtel des Invalides to gain arms and, on July 12, embarked upon the Storming of the Bastille. In May and June 1789, Desmoulins had written a radical pamphlet entitled La France Libre, which his publisher at that time had refused to print. The rioting surrounding the storming of the Bastille, however, and especially Desmoulins' personal and publicized involvement in it, altered the situation considerably. On July 18, Desmoulins's work was finally issued. The politics of the pamphlet ran considerably in advance of public opinion; in it, Desmoulins called explicitly for a republic, stating, "... popular and democratic government is the only constitution which suits France, and all those who are worthy of the name of men." La France Libre also examined and criticized in detail the role and rights of kings, of the nobility, and of the Roman Catholic clergy. The Discours de la lanterne, written from the perspective of the Place de Grève lamppost, was aggressive in its celebration of political violence, and attributed exalted qualities of loyalty and patriotism to the citizens who made up the Parisian mob. This hard-edged fervor found an appreciative audience in Paris, and Desmoulins, as a result of the pamphlet, became known as the "Procureur-général de la lanterne" ("the Lanterne Prosecutor" or "Lanterne Attorney"). In November 1789, Desmoulins issued the first number of a weekly publication, Histoire des Révolutions de France et de Brabant, which would run until the end of July 1791. This publication combined political reportage, revolutionary polemics, satire, and cultural commentary; "The universe and all its follies," Desmoulins had announced, "shall be included in the jurisdiction of this hypercritical journal." The Révolutions de France et de Brabant proved extremely popular from its first to its last number. On July 16, 1791, Desmoulins appeared before the Paris Commune as the head of a group petitioning for the deposition of Louis XVI, who had, in June of that year, briefly fled Paris with his family before being captured and escorted back to the city. The flight of the king had caused civil unrest, and the petition, presented a day before the anniversary of the Fête de la Fédération, contributed to this agitation. On July 17, a large crowd that had gathered at the Champs de Mars in support of the petition was fired upon by military forces under the command of the Marquis de Lafayette, an incident which became known as the Champs de Mars Massacre. Accounts differ as to whether or not Desmoulins was present at the Champs de Mars; in the subsequent upheaval, warrants for the arrest of himself and Georges Danton were issued. Danton fled Paris, and Desmoulins, though he remained in the city, and spoke on several occasions at the Jacobin Club, decreased his journalistic activities for a time. Early in 1792, following a bitter quarrel with Jean Pierre Brissot over a legal case which Desmoulins had taken up and discussed in several broadsheets, Desmoulins published a pamphlet, Jean Pierre Brissot démasqué, which attacked Brissot savagely and personally. Beginning December 5, 1793, Desmoulins published the journal for which he would be best known and most celebrated: Le Vieux Cordelier. Even the title of this short-lived publication spoke of conflict with the current regime, implying that Desmoulins spoke on behalf of the "old" or original members of the Club des Cordeliers, in opposition to the more radical and extreme factions that had now come into power. In the seven issues that comprised the Vieux Cordelier, Desmoulins condemned the suspicion, brutality, and fear that had come to characterize the Revolution, comparing the ongoing Revolutionary Terror to the oppressive reign of the Roman emperor Tiberius and calling for the establishment of a "Committee of Clemency" to counter the climate of mercilessness fostered by the Committee of Public Safety. In the fourth number of the journal, Desmoulins addressed Robespierre directly, writing, "My dear Robespierre... my old school friend... Remember the lessons of history and philosophy: love is stronger, more lasting than fear." The perceived counter-revolutionary tone in these calls for clemency led to Desmoulins' expulsion from the Club des Cordeliers and denunciation at the Jacobins. Desmoulins took an active part in the August 10, 1792 attack on the Tuileries Palace. Immediately afterwards, as the Legislative Assembly (France) crumbled and various factions contended for control of the country, he was appointed Secretary-General to Georges Danton, who had assumed the role of Justice Minister. On September 8, he was elected as a deputy from Paris to the new National Convention. He was affiliated with The Mountain, and voted for the establishment of the Republic and the Execution of Louis XVI. His political views were closely aligned with those of Danton and, initially, Robespierre. The appearance of the Vieux Cordelier in December 1793 marked the start of a rift between Desmoulins and Robespierre. Initially directed, with Robespierre's approval, against the excesses of the ultra-radical Hébertist faction, the journal was rapidly turned against Robespierre himself and his allies in the Committee of Public Safety. Its calls for a Committee of Clemency sharply divided Danton and Desmoulins, who advocated such a committee, from Robespierre, who viewed the idea as indulgent and dangerous. On January 7, 1794, the Jacobin Club sought to expel Desmoulins from its number. Robespierre, seeking to protect Desmoulins, suggested as an alternative that the offending issues of the Vieux Cordelier be publicly burnt. Desmoulins' response,"Brûler n'est pas répondre" ("Burning is not answering"), echoed the cry of Jean-Jacques Rousseau, the influential philosopher whose work was central to Robespierre's own vision of the Republic. Robespierre persisted in his attempt to protect his childhood friend (his argument was that Desmoulins was a "spoilt child" whom others had led astray), but Desmoulins' refusal to renounce the Vieux Cordelier made it politically difficult for any tolerance to be extended to him. The condemnation and execution of the Hébertists in March 1794 meant that the sole remaining serious source of dissent within the Committee of Public Safety's regime was the indulgent faction headed by Danton and voiced by Desmoulins. The energies of the Committee, and especially of Saint-Just, therefore turned to the elimination of the Dantonists. Charges were brought before the Committee of Public Safety, and an arrest warrant for Danton and Desmoulins was finally issued on March 31. Danton, Desmoulins, and many other actual or accused Dantonist associates were tried from April 3 through 5th before the Revolutionary Tribunal. The trial was less criminal in nature than political, and as such unfolded in an irregular fashion. The accused were prevented from defending themselves by a decree of the National Convention. This fact, together with confusing and often incidental denunciations (for instance, a report that Danton, while engaged in political work in Brussels, had appropriated a carriage filled with several hundred thousand livres of table linen) and threats made by prosecutor Antoine Quentin Fouquier-Tinville towards members of the jury, helped to ensure a guilty verdict. Additionally, the accused were denied the right to have witnesses appear on their behalf, though they had submitted requests for several - including, in Desmoulins' case, Robespierre. The verdict was passed in the absence of the accused, who had been removed from the courtroom to prevent unrest among the trial's observers. Their execution was scheduled for the same day. In a letter to his wife from the Luxembourg Prison, Desmoulins wrote, "It is marvellous that I have walked for five years along the precipices of the Revolution without falling over them, and that I am still living; and I rest my head calmly upon the pillow of my writings... I have dreamed of a Republic such as all the world would have adored. I could never have believed that men could be so ferocious and so unjust." As Desmoulins was taken to the gallows, he was informed of his wife’s arrest and went mad. It took several men to get him to the tumbril. He struggled and tried to plead with the mob, ripping his shirt in the process. Lucile was also soon to be slated for execution and died only eight days later. On December 29, 1790 Desmoulins married Lucile Duplessis, whom he had known for many years, describing her as “small, grateful, coy, a real Grueze.” Lucile's father long denied permission for the marriage, believing that the life of a journalist could not support any sort of family. Eventually it was, of course, Desmoulin's journalistic profession that brought both of them to execution. Among the witnesses to the marriage were Robespierre, Brissot, and Jérôme Pétion de Villeneuve. The Desmoulins' only child, Horace Camille, was born on July 6, 1792; his godfather was Robespierre. Horace Camille Desmoulins was raised by Adèle and Annette Duplessis (the sister and mother of Lucile, respectively). He was later pensioned by the French government, and died in 1825 in Haiti.